I think it’s been 10, maybe 15 years since I’ve actually worked on open source software as an author. I’ve helped fix bugs in things like Arduino and ReplicatorG, but I haven’t done anything major on my own. Until Friday, when my frustration with a certain class of software got the perspective and skill of my being a professional engineer. Instead of complaining, instead of getting frustrated with how someone else managers their project, instead of not being able to pull rank and make them do it my way, I can just go write my own and hand it out. It’s a nice feeling. I don’t think I’d have gotten here without writing it-cannot-fail code for security and privacy projects as a day job. That sort of rigor is like daily exercise for the brain, like daily exercise or workouts only for the brain. Soon after I started testing the Mk7 head it stopped moving plastic, period. I had a working Mk6 handy and a Mini MakerFaire to attend, so I fell back to the Mk6 and decided to let other people debug the Mk7. 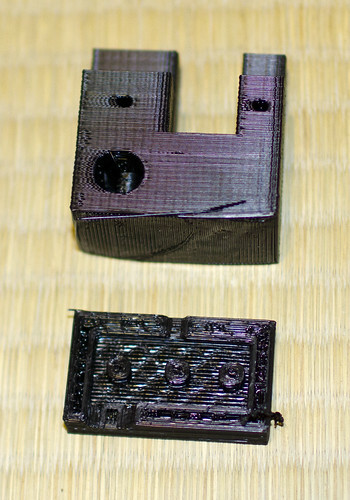 However, nobody on the MakerBot list really had a reason or a fix I liked, so I took it apart to fix on my own. The first thing I discovered was that the pressure mechanism for pushing the plastic against the stepstruder was not pushing hard enough, due in part to scratches on the head’s surface. The second — and more important — thing was that the stepstruder gear was filled with shreds of plastic. It came off easily, so like the Mk6, just pushing the plastic harder would clear the junk out of the motor. It’s really that simple. Grab a spare M4 bolt from your parts kit, buy a wingnut at the local hardware store and glue/Loctite the wingnut to the end of the bolt. I set it up, dialed in a temp of 240C (see earlier posts about temperature), and it forced plastic through with no problem at all. Even a 5 minute run ran without any problems at all. Now to print some test models…. I had the Mk.7 on the “needs help” bench while doing the previous set of temp tests. I took it apart and discovered the problem with it not pushing plastic was the tensioner against the drive. It had scratches and the drive pulley was clogged with plastic. After fixing that — see the next post for my cheap and adjustable tensioner — I put it on the Cupcake and did another set of temperature tests. $20 BBQ grill cooking thermometer. Cheap, easy to use, but I think their goal is to make sure I don’t kill someone with undercooked poultry. As with the Mk.6, the temperatures are lower on Replicator than on the other two sensors, so I need to run with much hotter temps than are required by the instructions. At this point I’m considering adding an offset/calibration value in the software so that the read temp is adjusted properly. Part of switching over to Gen 4 was improving daily operation by locking down the extruder and the build environment. Going to the Mk.6 Stepstruder was already in progress but I really needed to ditch the difficult-to-use but trendy Automatic Build Platform for the Heated Build Platform (HBP). It was great for making kid’s favors at a Maker Faire but a real PITA for complex or experimental objects. After some decent experiments with the Mk.7 (more on that later), I decided to try the 0.3mm head and 1.8mm plastic on the Mk.6 after the success with the 0.4mm head and 3mm ABS. It works, but not well enough to actually print. The drop from 3mm to 1.8mm plastic, almost %50, should have worked well with the drop from 0.4 to 0.3 but the extruder doesn’t want to extrude. There was some talk on the makerbot list that black 1.8mm plastic required higher temps, those were red-lined by the software, so I did some measuring on my own. Back in the early days, getting your print temperature correct was one step from ritual magic. That seemed likely, so I decided to repeat some early tests and wire up second and third sensors to run in parallel with the default sensors. With these, I collected some data and made some graphs. The sensor tips were put as close to the MakerBot sensors as possible and I waited as long as seemed reasonable for the temperature adjustments to stabilize after a change. The short answer is this — the replicator is reading at least 10C lower than anything else, so I need to run with much hotter temps than are required by the instructions. cupcake + gen 4 + hbp + mk7 + 0027alpha ==> works! Well, it’s working, and quite nicely. I don’t have the print range of a TOM, but I have quality, and that’s what I was after. The trick to getting it all working was replacing the Z stepper that shipped with Cupcake #235 and replacing it with a more powerful one from Lin Engineering (which required a new metric pulley from SDPSI). The Z-table is now quite zippy and does not stall like the old one did. Photos and parts lists to be posted everything’s a scattered mess in the aftermath of Pittsburgh MiniMaker Faire, the lasersaur build, fixing my mom’s laptop, and a thousand other papercuts. I wanted to make a sturdy-but-hollow manifold for the air assist on my lasersaur. I ended up using a trick I’ve seen in catacombs and gothic structures — internal support columns. A bit behind on the blogging thing these days due too much ‘real’ work, but I thought I’d show off one of my latest mini-projects. It’s a modular tool-rack for the MakerBot Cupcake, published on thingiverse as modular tool-holder rack. Turns out my boards were dead, MakerBot RMA’d them and the new ones seem to be working just fine for manual controls and temp settings. Will do some test runs, get some end-stops made, and post a how to in the next week or so. Well, that didn’t go so well. After a couple of weeks of fussing and fighting with Gen 4 electronics it appears I have a bad motherboard. Countless hours of diags down the drain because of a bad board. Something we in the open source hardware need to adopt is the idea of standardized tests / QE. If I were at work, the first thing we’d have done was toss the mobo in the “to be re-tested” pile and grabbed a fresh one to see if we could replicate the problem. On the up side, while researching the problems I was having, I stumbled across a great blog that every Makerbot owner should read.